Even if you don’t have allergies… Whole House Air Filters are a must have in today’s Las Vegas homes. Dust, pollen, dander etc. can be harmful and irritating. Cal Air can protect you against the harmful effects of air pollutants in your home. Your indoor air quality can be improved drastically with a Carrier Infinity air filter, also known as a whole house air purifier. Smog- or atmospheric pollutants – are still at dangerous levels in Las Vegas. The American Lung Association has rated Las Vegas air quality levels with a grade of F in its “State of the Air 2012” report in April. According to the American Lung Association, poor air quality has been found to cause a number of health problems including asthma, coughing, heart attacks, and premature death in children and elderly. It is a health risk not to purify your indoor air. Protect your family from the pollutants trapped inside your home with a Carrier Infinity Air Purifier System! Kids bring so much joy in the home. Along with a lot of bacteria, viruses and other microbes. Help control and eliminate these with the use of a Carrier Infinity Air Purifier. Even pets create airborne pet dander that can be problematic. 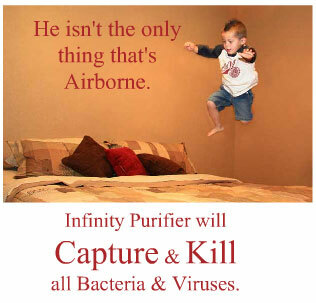 The Carrier Infinity Air Purifier is designed to eliminate many airborne irritants such as dust, mold, and allergens.